Sometimes, out of my expectation, they open up in my heart. Those pure perfect cut aquamarines reflect pieces of me on their numerous facets. and their burning core with a trace of olive. They gaze me through, piercing holes without blood or burning out without ashes. the single one shot accidentally brought up by a flash back. in dynamic dimensions acknowledged yet not comprehended. Now what’s the limits and qualifications for? I’ve entered winter; and this is so fair. none related to my own past no more. how they breed our greed and hate, secrets and needs. all about the coming dawn. In the philosopher’s prophet irrelevant to the alchemist. Why you swam in the red pond, full of rusty screws and dripping dome covering their lies. your cape in the mystery and legend in the handbook. How the dynamic theory triggered the floating bird with both wings broken. and you came to me with that fragile smile and incoherent speech. without a retrospect on the public’s perception of awesomeness. It’s Autumn again yet nothing stays the same. For my heart, there were too many things happened to bear. But hey, here we are. Isn’t that amazing the most desperate and dead season is also the most productive and fruitful one? We see the tiniest signs of life dying or going into dormant. and we ourselves? We reach a silent and confusing conciliation. Time moves toward us, carrying its benevolence and mercy. She has told me to remember and to appreciate; she has told me to be as I hoped and wished. So, hey, here we are; and there we will be. I finished the book in early November, on the subway to my office. The meld early winter sunshine crawling up the buildings and leaking through tree leaves. 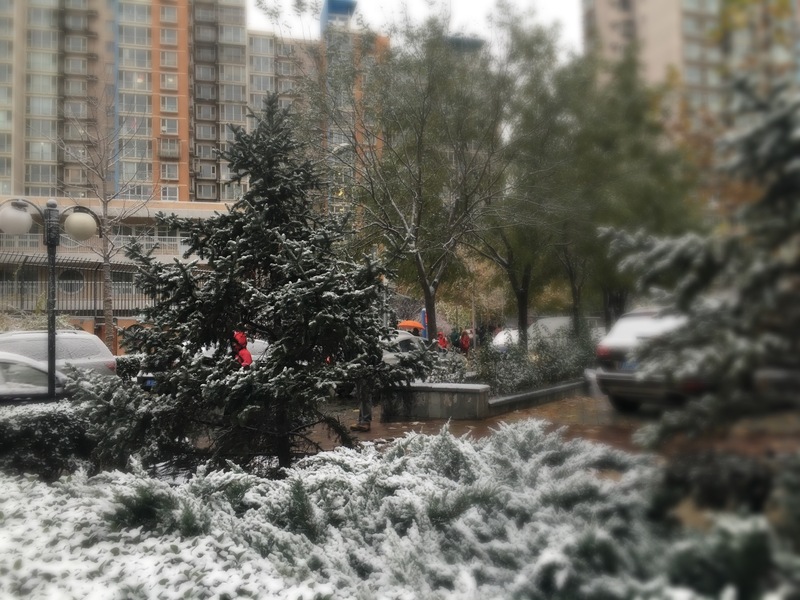 People walking on Chang’an St. all wrapping themselves up in winter coat, hurrying to east or west. It is not the first time since I came back to the city that myself feeling this surrealistic experience of the shifted time and space. But it is also the first time I feel the contrary solidity of this life. It is impossible to repress the tremendous sadness and silence falling in this city, though it never truly involved in WWII. Yet all wars are essentially alike. The harm they all do to people who lived through and the trauma they all cause to those who were at the battle field, viewing death and wounds, would vibrate and echo through time, left the long scar others wouldn’t comprehend. People live at the present are really lucky, for they may never experience a real war. Mom told me there is the invisible war going everywhere, this is not an era of peace. Yet smokes and gunpowder are something different, they cause enduring and irreversible and enduring impact not merely relevant to human history, but individuals’ real life. I always pictured Doerr a female writer, not until the acknowledgement reveals that he is a gentleman. His detailed and carefully selected scene description knits a world so close to both the war time and the present. The last 5% of the book, time flies across nearly 50 years, no one sees the new century coming. Yet it does. It does, in a way we already knew, in a way we are so familiar with for we are living in this era; yet so strange in a way that the war is still hovering there, in the former several pages, on hearts of those we may know who survived from it long time ago. I couldn’t help to compare Doerr with Flanagan. I awe the strength and power hidden behind Flanagan’s words; I awe his objectiveness and sanity and masculinity and the specific and complete sense of authority when telling a story of the war. I’ve loved his self control on maintaining the same tone when telling two story lines divided by different themes–a love story and an military story. Doerr did poorly on both, yet when you follow through the plot development, you see his sentimentality, his caress of humanity and those tiniest particles of one’s life. He uses a different lens to focus on feelings and emotions rather than events. Here are some highlights I did on the book. “Frosts show up at night, throwing a silver sheet across the landscape, and Werner wakes in the back of the truck with his fingers mashed in his armpits and his breath showing and the tubes of the transceiver glowing a faint blue. How deep will the snow be? Six feet, ten? A hundred? “On the third afternoon of the siege of Saint-Malo, the shelling lulls, as though all the artillerymen abruptly fell asleep at their guns. Trees burn, cars burn, houses burn. German soldiers drink wine in blockhouses,. A priest in the college cellar scatters holy water on the walls. Two horses, gone mad with fear, kick through the door of the garage in which they’ve been shut and gallop between the smoldering houses on the Grand Rue. “The only sound is the patter of the rain turning Saint-Malo into mud. It could be a trick. Maybe he heard her open the can of beans, went noisily downstairs, and climbed quietly back up; maybe he stands outside the big wardrobe with his pistol drawn. The artillery screams; the cellar shudders. “The girl emerges from the bakery, steps neatly off the curbstone, and makes straight for him. The poodle squats to relieve itself on the cobbles, and the girl veers neatly to her left to skirt it. She approaches Werner for a second time, her lips working softly, counting to herself-deux trois quatr-coming so close he can count the freckles on her nose, smell the loaf of brad in her knapsack. A million droplets of fog bead up on the fuzz of her wool dress and along the wrap of her hair, and the light outlines her in silver. He stands riveted. Her long pale neck seems to him, as it passes, incredibly vulnerable. She takes no notice of him; she seems to know nothing but the morning. This, he thinks, is the pure they were always lecturing about a Schulpforta. “He is a ghost. He is from some other world. He is Papa, Madam Manec, Etienn; he is everyone who has left her finally coming back. Through the panel he calls, ‘I am not killing you. I am hearing you. On radio. Is why I come.’ He pauses, fumbling to translate. ‘The song, light of the moon?’ She almost smiles. Marie-Laure slides open the wardrobe. Werner takes her hand and helps her out. Her feet find the floor of her grandfather’s room. “Max swims awkwardly,windmilling one arm forward and then the other, periodically looking up to make sure his mother is watching. When he’s done, he wraps himself in a towel and climbs into a chair next to her. Max id compact and small and his ears stick out. Water droplets shine in his eyelashes. Dusk seeps down through the overcast and a slight chill drops into the air and one by one families leave to walk or bike or ride the bus home. Max plucks crackers our of a cardboard box and crunches them loudly. ‘I love Leibniz Zoo crackers, Mutti,’ he says. From the loam of Jutta’s memory rises a sentence: What I want to write about today is the sea. ‘We spent a month there. I think he might have fallen in love. I finished this book about a month ago, surprisingly found out I’ve read several books and a few movies on WWII in the recent two years. I remembered how I was laying in the bed in Nora’s house, sweating dry from the summer’s heat; I remembered how Richard tells the story of a bunch of strong and masculine guys broke the fish restaurant window opening the war window to me. I thought All the Light We Cannot See is a love story, and I pictured Anthony a young lady just graduated from a writing program. Only if technology and big data could be used to do human being analytics, I would collect them all claiming this is just an extension of psychoanalysis. People shouldn’t start wars cuz they are bad things. They shouldn’t start wars cuz wars hurt people. When the present combined with traumatic memories, with lost and not found, with ruined faith and guilt and bone-hard scars, time would stop and watch, hang and torture. Does he find it for her? I think he does.